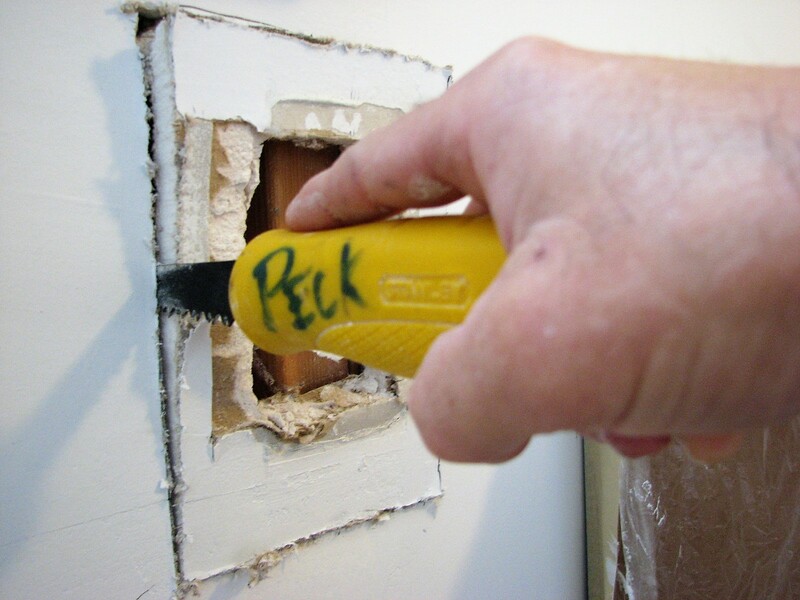 Watch this whole drywall repair video below for yourself and see the amazing results. Today I’m going to show you how to repair water damaged wall and also how to match the orange peel texture all in one day! First I’m going to need to square up the drywall cuts using a four foot level and marking a line with pencil and cutting it with a sharp blade on my razor knife. I’ll also be adding a 2′ x 4′ and furring strip to be able to attach the drywall to since the cuts are past the last wood studs on both sides. Then I’ll install the half-inch drywall. I’ll be using a fiberglass mesh drywall tape and a 20 minute fast setting joint compound that gives you a 15 minute working time for each coat of mud on the repair. Once that is dry I’ll be spraying an orange peel spray texture to match the existing texture. I’ll be using a Graco texture hopper and a BOSTITCH pancake compressor that I use if i’m just doing a drywall repair this size or smaller. Using the finish nail gun that came with the Bostitch compressor, I also installed some new baseboard on the two water damaged walls. The homeowner’s are going to prime and paint the entire room over the weekend. Let me know if you have a drywall repair to do? Feel free to ask any questions about my water damaged drywall repair and orange peel texture matching techniques in this video?